When it’s scorching outside, all you want to do is be near the water. Unfortunately, a million other people do, too. Enter: the race for towel space. So rather than fight the crowds at the most popular lakes and beaches this summer, head to these lesser known—yet still totally worthy—havens. They have all the same perks (scenic views, great hotels and dining options)…just a few less tourists to contend with. See you there. Let’s put it this way: Sullivan’s Island is one of the reasons you visit Charleston…and then keep returning. Unassuming, peaceful and frequented only by those who are lucky enough to know about its existence, it’s close enough to two must-visit stops: The Obstinate Daughter for casual seafood eats in a rustic sea shanty-esque setting and The Beach Club at Charleston Harbor Resort & Marina, the only hotel in Charleston located on the water that also has a bike program with Schwinn, so you can ride around town for free. Who said the Midwest didn’t have great beaches? Take a ferry to get this pristine three-mile stretch of sandy beach in the Sleeping Bear Dunes Lakeshore National Park. Replete with wildlife, bluffs and lush forests, this little known part of the Mitten State is said to be one of the most stunning natural places in the country. All you care about, though, is that clear, inland lake water. Ahhh. If you want to get your beach and your camp on, venture to the “back side” of Catalina Island, and you’ll find the less-crowded, lesser-known beach where you can set up camp. Rent all your equipment on site and get ready to cast away. The Catskills is clearly having a resurgence with more properties popping up all over the nostalgic New York nook. But the unspoiled allure of its many lakes and rivers remains the same, with Colgate Lake being one of its best. Check into Deer Mountain Inn (a ten-minute hike from there) for its arts-and-crafts-style charm and locally-sourced tasting menus. Try white-water tubing on Esopus Creek before lunching at revamped retro hot spot Phoenicia Diner. For a day outdoors, slop on the sunscreen and hop on your bike to ride a few miles from Old Cutler Road to this calm spot in Coral Gables. You can spend all day on the main beach or, if you really want to channel Castaway, head over to a tiny strip of serenity for some alone time. Gooseberry is a secret beach dream come true. It’s just as nice as private (and impossible to get into) Hazard’s Beach and Bailey’s Beach, and it’s only a mile from the Newport mansions and Bellevue Avenue. Hotel Viking is one of the most notable places to stay. A Historic Hotel of America, it has everything to make you feel like you’re living in the Gilded Age: Spa Fjör for when you need to be pampered; a rooftop bar for when you need to imbibe; and a “Catch & Cook” program at One Bellevue for when you need to feast. Make Mad River Valley base camp for a quintessential New England getaway full of antiquing, flying sailplanes over the adjacent peaks, kayaking the river, golfing at Sugarbush Resort and maple sugaring (yep, it’s a thing). The little village of Warren is also home to romantic refuge The Pitcher Inn. Aside from its one-of-a-kind themed suites and guest rooms, it also boasts The Robert Frost Library—aka cozy nights reading next to the fire, after shuffleboard and craft beers at Tracks, followed by dinner at 275 Main. If heights and elevation don’t get to you, then this Taos treasure will be well worth the trek. Located high up in the Sangre de Cristo Mountains is Williams Lake (at 11,040 feet), it’s 45 minutes from downtown Taos and accessible by hike or drive. It’s also surrounded by vista views straight out of a movie and the perfect spot for a picnic or selfie opp. Hermosa, Manhattan and Santa Monica Beaches may get all the love in Los Angeles, but don’t forget about the other South Bay area gem: Redondo Beach. This coastal playground makes for the ideal summer jaunt, thanks to its close proximity to LAX and reputation as a surfing, sailing and volleyball mecca. It’s also known for The Portofino Hotel & Marina, where you’ll be greeted by nautical-chic decor and free-flowing libations on the private balcony. Consider this a two-for-one: not only do you get pristine Lake Michigan beaches and smooth sand at your feet, but you get the Indiana Dunes, which means 50 miles of hiking trails and plenty of shoreline. After a day in the sun, visit Carlson’s, one of the last remaining drive-ins in Indiana. Psst: If you really want to avoid the crowds, camp on the grounds and hit the beach before everyone else does. 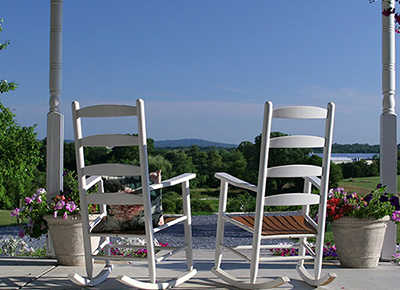 Known as the “Jewel of the Blue Ridge Mountains,” Smith Mountain Lake is the second largest body of freshwater in Virginia, and one of the most stunning sanctuaries in the state with 1,500 acres of hiking trails, guided canoeing tours and freshwater fishing. And if you happen to time your trip to the Smith Mountain Lake Wine Festival or Oktoberfest and 5k Trail Race, even better. As for sleeping, Mariners Landing is the best bang for your buck. If you and your crew are planning a true wilderness vacation, the Lakes Region of central New Hampshire is where you should do it. Just south of the White Mountains, spanning the borders of Grafton, Carroll and Belknap counties, this picturesque community offers everything from quaint cottages (at Rockywold Deephaven Camps) to tons of aquatic fun along the lines of boating, swimming and bass, trout, and salmon fishing in Big and Little Squam Lakes. Martha’s Vineyard regulars usually head to Katama Beach, but two of MV’s most beloved spots are actually East Beach on Chappaquiddick “Chappy” Island and Long Point Beach in West Tisbury. Both are protected by The Trustees of Reservations and easy to get to from Harbor View Hotel (a popular place to stay in downtown Edgartown) or Winnetu Resort, upscale and tucked away with extensive programs for families and island favorite restaurant The Dunes. Unless you’re a local, you may not know about this gem 20 minutes outside Savannah. Here you can kayak through salt marshes to spot exotic birds, paddle over to uninhabited and pet-friendly Little Tybee Island, go on a dolphin adventure and get your camping (or glamping) on at CreekFire Motor Ranch. If you prefer cushier quarters, you can check out the newly opened and very posh Perry Lane Hotel, which is only an Uber ride away, and it’ll pack you a picnic basket to go with goodies from the Emporium Wine Market. Two words: Lobsters and waves. Just over an hour from Boston, and minutes from coastal villages York and Ogunquit, there’s Ogunquit Beach, where you can get your hands on both. It’s also where you can enjoy a one-of-a-kind stay at Cliff House Maine, which overlooks the panoramic cliffs and Cape Neddick Lighthouse. As for dining options, don’t miss farm-to-table restaurant The Tiller and Nubb's, a classic Maine lobster shack. When in North Carolina, swing by Lake Lure Beach (27 miles from downtown Asheville), where curious travelers can stroll along the Flowering Bridge, sunbathe on the beach, hike the Rumbling Bald Trail or take in views of the Hickory Nut Gorge. Come August, you’ll also be able to check into hyped up The Foundry Hotel, (housed in the city’s former steel foundry) for hyper-localized experiences like: private hood tours led by locals, interactive botany lessons, luxury fly-fishing excursions and wildflower bouquet-making classes. Surrounded by Wells College, award-winning wineries (like Hermann J. Wiemer Vineyard) and the darling Inns of Aurora (owned by American Girl founder Pleasant Rowland), this New York state lake town offers plenty to do: wine and cheese hour by the fire pit, paddle boarding and kayaking on the lake, biking through town, restorative yoga or meditation sessions, and an intimate evening for two at the Aurora Inn Dining Room. Prepare to spend a week in The American Rivera, aka Santa Barbara. There are so many great beaches here (including Butterfly Beach and Refugio State Beach), but Summerland Beach is our favorite. It's dog- and horse-friendly with a special dog washing station and sunset horseback riding tours. Date night, anyone? Meaning “purple island,” this secluded paradise is far less touristy than most of the Florida Keys, which means you’ll be nestled in a sanctuary of swaying palms, coral reefs, exotic plants and tropical fauna. But don’t worry, there are plush accommodations at The Moorings Village, a former coconut plantation with 18 individual villas for guests.